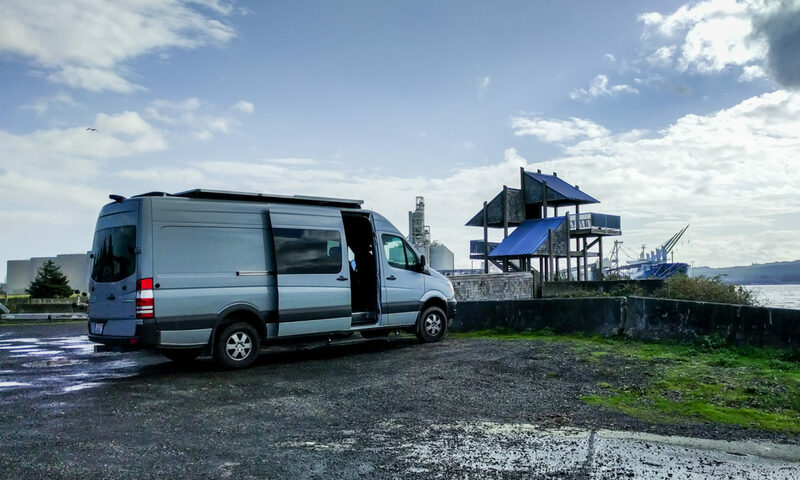 We’ve been living with some regular bike stands in the back of the van, but they are hassle to use. Every time we drive anywhere we have to clamp the bikes down with a cargo strap. 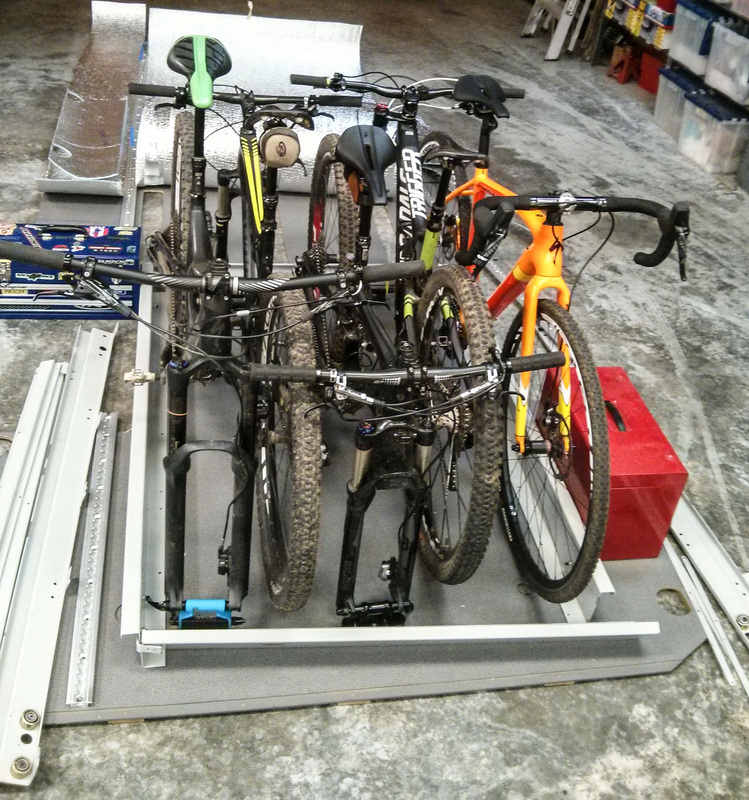 Longer term, we plan to add a drawer with built-in bike racks and fork mounts. Pulling the drawer out will give us easy access to load and unload the bikes. We ordered a drawer that’s designed to go in Class A RV lockers – the storage areas that are underneath the living area, accessible from outside. It’s a Kwikee SuperSlide 2. We bought it from PPL RV who were the cheapest online place we could find, but pretty uncommunicative. They also sell through Amazon. They either drop shipped from Kwikee or just re-shipped to us as soon as the parts arrived. The quality of the one we ordered was terrible for the price we paid. The components weren’t well packaged and so the paint was scraped up in shipping. But, that doesn’t matter because the thin paint was peeling off and had rust bubbles underneath it anyway. They provide a series of fitting struts to ensure the unit is square when you install it, but the struts pushed the unit well out of square when we riveted them in place. That meant drilling the rivets out and using a framing square to make sure everything was lined up properly. We’ll make it work by sanding and re-spraying, but I wouldn’t buy from Kwikee unless you want a lot of extra hassle. The idea of the drawer is great. It runs on roller bearings. You buy the runners separately from the part that makes the width of the drawer. You can see more about it in the support documents. The rated weight is 800 lbs and I believe it, if the thing is well bolted in. Even if the quality of the workmanship was good, there’s another issue. The metal pieces that make the width of the drawer only come in stock sizes. The width we have available in the van is between two of those sizes. I ordered the wider one and might just take it to a local metal shop to get the ends re-bent using their brake. We’ll have to re-spray the whole thing anyway, so that’s not a massive issue. If you do decide to go the same route, I’d suggest just buying the runners and then using 1/2″ or 3/4″ plywood to make a sturdy floor, front and back piece. Four of our bikes weigh less than 150 lbs. Even if a person stood in the drawer it should be just fine with a wooden floor rather than the crazy combination of wood and pressed metal cross pieces they sell. We’ll post again when the thing is sanded, sprayed, and installed.